Bulk Wedding Decorations -- FREE SHIPPING! Rankhilfe für Rosen und andere Kletterpflanzen. (ohne Deko). - Rankhilfe und Rankgitter für Rosen und andere Kletterpflanzen. Betten, Kopfkissen und Zubehör. Freundliche und kompetente Beratung. Lampen und Licht. Dieser Rosenbogen verfügt über eine Flügeltür. Dieser reich verzierte Torbogen besteht aus pulverbeschichtetem Eisen. Er ist dadurch sehr stabil und witterungsbeständig. • Perfekter Halt für Kletterpflanzen aller Art. Gardman Elegant Wooden Garden Arch Sea Breeze Blue Pergola Plant Support Stock Code: 07717 Elegant, sturdy FSC certified wooden construction. Detailed side panels. Makes great feature which can be enhanced with climbing plants. Can be sunk into earth or concrete trenches or used with metal ground spikes, available separately. All fittings supplied 4mm Allen Key. Height: 215cm Width: 115cm Depth: 40cm. Provides decorative support for climbing plants. Extra wide construction for spacious walkways. Perfect addition to walkways or for adding a feature to your garden. Made from black powder coated tubular steel. Ground hole maker included. WPC Eingangspergola - 150 x 50 x 200 cm - Braun. 1x WPC Eingangspergola inkl. - Perfekt geeignet als Garteneingang, Durchgang oder Dekoration Ihres Gartenweges. Haus und Garten. [NEU.HOLZ]. Die Gartenpergola wertet den Eingang Ihres Gartens auf und bildet zusätzlich eine stabile Rankhilfe für Kletterpflanzen. Kingfisher Elegant Decorative Garden Black Steel Metal Arch Pergola Gate Stock Code: WARCHG Bring a romantic touch to your garden with this elegant and stylish garden arch for climbing plants. Creates height and interest in a garden. Perfect for honeysuckle, roses and clematis. Makes a stunning frame for garden entrances, pathways and views. The twin opening gates are finished with brass effect finials Made from black powder coated proof tubular steel. Easy to assemble. PLEASE NOTE - The gold gate finials are not included Width 140cm x Depth 41.5cm x Height 242cm. Garden Arch. Black, powder coated steel construction. Colour: Black. Approx Size: H2.4mxW1.4mxD20cm. › Watch Item ‹. WPC Eingangspergola - 150 x 50 x 200 cm - Grau. 1x WPC Eingangspergola inkl. - Perfekt geeignet als Garteneingang, Durchgang oder Dekoration Ihres Gartenweges. Haus und Garten. [NEU.HOLZ]. Erfahrener Onlinehändler seit über 10 Jahren. Gardman Ground Spikes for The Elegance Arch 07712 / 07713 07715 Description Ground Spikes for 07712 / 07713 Arch Ways Set of 4 metal ground spikes for use with the 'Elegance Arch'. 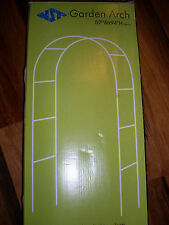 Used to hold garden arch rigidly in place offering stability security. Instruction provided on packaging. Dimensions: 4 x 4cm. 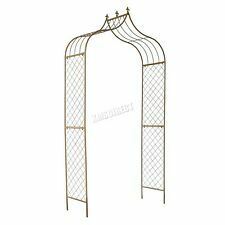 Gardman Loire Decorative Iron Metal Garden Arch Signature Collection Stock Code: 00535 Part of the signature collection. Decorative iron arch with a scroll design. Creates height and interest in a garden. Makes a stunning frame for garden entrances, pathways and views White grey wash finish with beautifully detailed side panels. Can be sunk into the ground, concrete trenches end or used with ground spikes 07715. 2.4m x 1.2m. Turn your garden into a neighborhood showplace with this elegant architectural feature. Impressively scaled trellis with a peaked top provides your climbing vines and other plants with plenty of support. 96" Wedding Arch. Good Addition To Your Wedding, Party, Shower. with 200 Clear Lights. Very Easy To Set Up. Two Hundred Clear Lights. The Lights are operated by 110 Volts AC. You Can Add Your Own Decorations, To Give It. Chez GREADEN on sait combien il est important pour les professionnelles d’avoir du matériel robuste et de qualité ! BARNUM PLIANT 3X3M 50MM EN ALUMINIUM PREMIUM PRO 520G/M2. Desvis enveloppées par des nylons pour bienrenforcer chaquejonction croisée avec des tubes ovales. Ideal for roses and other climbing plants. Sure to be the envy of your neighborhood, its 43-square-foot interior space is ideal for seating or as the perfect spot for a special ceremony. Constructed of rust-resistant, powder-coated, 7/8" tubular steel in a lustrous chocolate brown finish, our classic piece of garden architecture is pure French style. 2.4M GARDEN ARCH PLANTS TRELLIS. Great for plants like roses and ivy which love to climb. Makes a great feature in the garden. Size: 240cm x 140cm x 37cm. Reasons to buy from Quickdraw. This high quality steel garden arch is a perfect choice for those who wish to add an eye-catching piece to your garden patio or terrace. With a modern look and black finish this archway will fit right in amongst any type of garden and is ideal for roses and other climbing plants to grow on, giving them the support they need to thrive and bloom. Wandbrunnen führen wir bis zu einer Breite von 225 cm, mit 1 oder 2 Wasserausläufen. Maße in cm: Höhe 20 Breite 25 Länge 250. Alle Produkte sind armiert. Absolut wetterfest und frostbeständig. Ausführung im exclusiven Antiquariato Design. Chez GREADEN on sait combien il est important pour les professionnelles d’avoir du matériel robuste et de qualité ! BARNUM PLIANT 4X8M 50MM EN ALUMINIUM PREMIUM PRO 520G/M2. CONTENU DE LA TENTE PLIANTE 4X8M 50MM EN ALUMINIUM PREMIUM PRO 520G/M2. Set of 4 Lattice Sheets. Powder Coated Steel Wire. Wandbrunnen führen wir bis zu einer Breite von 225 cm, mit 1 oder 2 Wasserausläufen. Maße in cm: Höhe 20 Breite 25 Länge 200. Alle Produkte sind armiert. Absolut wetterfest und frostbeständig. Ausführung im exclusiven Antiquariato Design. Wandbrunnen führen wir bis zu einer Breite von 225 cm, mit 1 oder 2 Wasserausläufen. Maße in cm: Säulenhöhe 238 Standfläche 50x50. Alle Produkte sind armiert. Absolut wetterfest und frostbeständig. 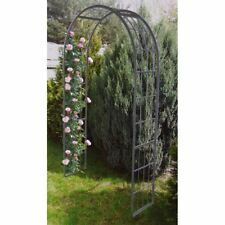 Metal Plant Arch Garden Steel Tube Archway Climbing Plants Climber Frame The perfect finishing touch to any garden, this lovely garden arch is easy to assemble, durable construction, and ideal for roses and other climbing plants. Features: ---Garden Steel Tube Arch ---Easy assembly ---Ideal for all climbing plants ---Approx size: 140 x 230cm. Ideal For Making Garden Features And Training Climbing Plants. GARDEN ARCH. Legs Can Be Inserted Into Ground For More Stability. Width: 1.36m. Height: 2.4m. Gardman Easy Black Metal Garden Arch 07707 Plant Flower Support Stock Code: 07707 Great value full height arch. Creates height and interest in a garden. Perfect frame to support you plants. Makes a stunning frame for garden entrances, pathways and views. Black polyester coated finish. Easy to assemble. 2m x 1.4m. The arbor dis-assembles into 9 pieces by removing approx.16 wood screws. 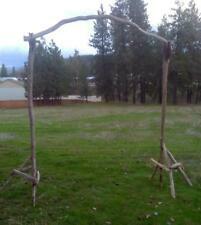 The driftwood arbor is designed to be portable and easy to install and take down. Perfect for a wedding planner. The arbor can be used for a weddiing and then moved to a permanent location in a garden or backyard or it can be boxed up and re-sold. The obelisk is made from black powder coated steel tubing and includes all the fixing and fitting. Perfect for any garden and can be used in a variety of ways to achieve a modern and stylish look, ideal for climbing plants and roses and works well on pathways, gateways and opening.